I’m serious, you can totally make this card in under five minutes. Since I already had the Botanical Gardens Designer Series Paper out, I decided to use that Product Suite again. Simply cut the pattern paper into a 4″x5.25″ piece and adhere to the Mossy Meadow card base. Then add the same exact size piece from the Botanical Gardens Designer Vellum Stack. I really like the Vellum on this card – it tones down that super bright pattern paper. The Whisper White is 2.5″x3″ and the Crushed Curry is 2.75″x3.25″. The corners were trimmed with the Curvy Corner Trio Punch. The sentiment, flowers and leaves were stamped and rhinestones added. Before I fastened down the sentiment, I made a small slit in the side of the card and tied the ribbon. Now, here is a similar card that can also be made in five minutes IF you just happen to have extra flowers lying around. Let’s face it, most of us crafters have extra bits lying around that didn’t make the cut on another project so you very well might already have extra flowers waiting to be used. 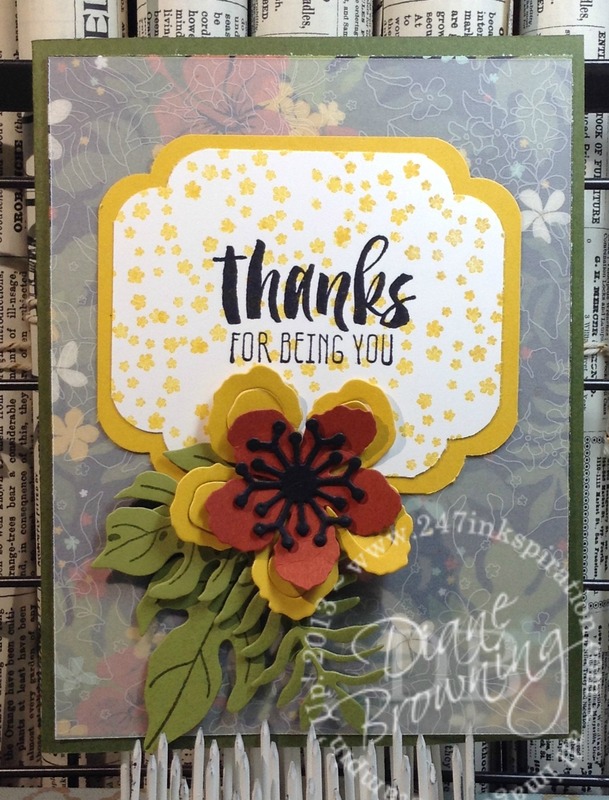 By keeping the stamping simple and having just a few pieces to work with, you really can make a card in just a few minutes!